By Loop Staff | December 3, 2018 View as "Clean Read"
Loop reader Mike Witsch contributed some fascinating trivia, though perhaps not trivial to those involved, from The Writer’s Almanac by Garrison Keillor. The first outbreak associated with Typhoid Mary occurred in 1900, in Mamaroneck, New York. Here is her story. 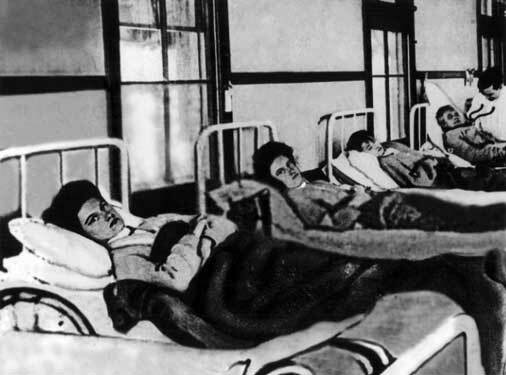 In 1915, the woman known as “Typhoid Mary” was put into quarantine in a cottage in the Bronx. Her name was Mary Mallon, and she was a large and fiery Irish-American woman about 40 years old. She worked as a cook in and around New York City, and every household she worked in seemed to suffer an outbreak of typhoid fever. Typhoid is caused by a form of Salmonellabacteria, and is usually spread by contact with human or animal waste. It was common on battlefields — it may have killed more than 200,000 soldiers during the Civil War — and in poor and unsanitary housing conditions, but it was rarely seen in the wealthy households like the ones where Mallon worked. Mary had been cooking for a local family for about two weeks when they started to become ill. The same thing happened the following year, when she took a series of jobs in Manhattan and Long Island. She helped take care of the sick, not realizing that her presence was probably making them worse. In 1906, a doctor named George Soper noticed this strange pattern of outbreaks in wealthy homes. He went to interview each of the families, and found that they had all hired the same cook, but she never left a forwarding address when she moved on to other employment. He finally tracked her down after several cases in a Park Avenue penthouse, so he interviewed her. She didn’t take it well, and swore at him, and threatened him with a meat cleaver when he asked her to provide a stool sample. He finally called in the police and had her arrested. Urine and stool samples were taken from Mallon by force, and doctors discovered that her gall bladder was shedding great numbers of typhoid bacteria. She admitted that she never washed her hands when cooking, but she didn’t see the point, as she was healthy. No one had ever heard of a healthy carrier of typhoid before, and she refused to believe that she was in any way sick. They wanted to take out her gall bladder, and she refused. They demanded that she give up cooking, and she refused to do that too. They confined her for a while and put her to work as a laundress for the Riverside Hospital, and in 1910 — after she promised to give up cooking and only work as a laundress — she was released. It wasn’t long before she changed her name to Mary Brown and took a job as a cook. For the next five years, she stayed one step ahead of the doctors and the law, spreading disease and death in her wake, until they caught up with her on Long Island. Authorities placed her in quarantine on North Brother Island in the Bronx for the rest of her life, and she died of pneumonia in 1938. Interesting, Mike! I see, via the 1905 NY State Census that a Mary Mallon, born in Ireland, age given as 38, was living with the Edgar B. Carroll family in Larchmont on Woodbine Avenue, listed as a “Servant”, and noted as living in the U.S. for 4 years. Could this be “our” Mary Mallon, I wonder? Not sure which house on Woodbine– the Carrolls may have been renting at the time. If, indeed, this Mary Mallon was “Typhoid Mary”, the Carrolls seem to have escaped that affliction.